The latest issue of the CDC's Morbidity and Mortality Weekly Report contains a notice to readers, advising them of revisions that were made to the estimated impact of the 2009 H1N1 Influenza vaccine. Before I get into the specifics of the notice, I just want to point out how cool it is that organizations like the CDC that are based in science will readily correct themselves, even before anyone outside the organization points out an error. This is something that I don't think I've ever seen from an anti-vaccine organization, even when glaring errors are highlighted for them. So, what does the CDC say? Throughout my life, I have gone back and forth on the issue of the death penalty. Back in Texas, death sentences were carried out often while I was living there. Every couple of weeks, it seemed, the local media covered an execution, showing pictures and video of protests outside the prison. Some people would protest that the death penalty was archaic and unnecessary in a modern era and a modern country. Others would protest that the most horrible crimes needed the absolute punishment. For some time, I agreed with the latter. I agreed that some crimes were so heinous and unforgivable so as to deserve the death penalty. I saw the death penalty as a clean and almost surgical procedure and an unfair way for someone to exit this world when compared to how then killed someone else. As I grew and matured, I came to see the death penalty as something else altogether. It doesn't stand for justice anymore, in my mind. As far as I am concerned, it is plain vengeance. The families of the victims demand it not because they want justice. They just want someone, anyone, to pay for the crime which took their loved ones away. I see it in the faces of the mothers, fathers, and siblings who are interviewed after a big case is closed and the verdict calls for death. And I see it when those same families show up to witness the execution. I just don't believe in vengeance. I believe in justice. At the very least, Troy Davis deserves a new trial. Why not a full exoneration? Well, because a grand jury did indict him, and another jury did find him guilty. There was evidence against him, and not all the witnesses changed their stories. As Amnesty International has stated, there is just too much doubt about the validity of the evidence that led to the conviction. There is also a bigger picture look at this case as well. In the bigger scheme of things, if Davis is executed and later found to be innocent because someone confesses to the crime or some other evidence is found that exonerates him, that will cast an enormous cloud of doubt over the entire justice system. It would be a cloud bigger than the one that hangs over it today as a disproportionate number of people from minority backgrounds get convicted at a higher rate and with harsher sentences. As a society, we need to trust our justice system. We need to know that the police will not make up charges against us so that we can report the real crimes to them and live in peace and prosperity. We need to trust our judges to take into account all the evidence so that we can hold responsible all the people who would do harm to us and our country. And we need to know that juries will not be manipulated by District Attorneys who want to score political points. When asked about the attention the Davis case is attracting, the mother of the victim answered: "I just think they should stay away. They don't know the case, they're just running their mouths," says Anneliese MacPhail, the slain officer's mother. "It's none of their business. They don't know all the circumstances." No, we don't, Mrs. MacPhail... As a country, a society, as human beings, we desperately need to. 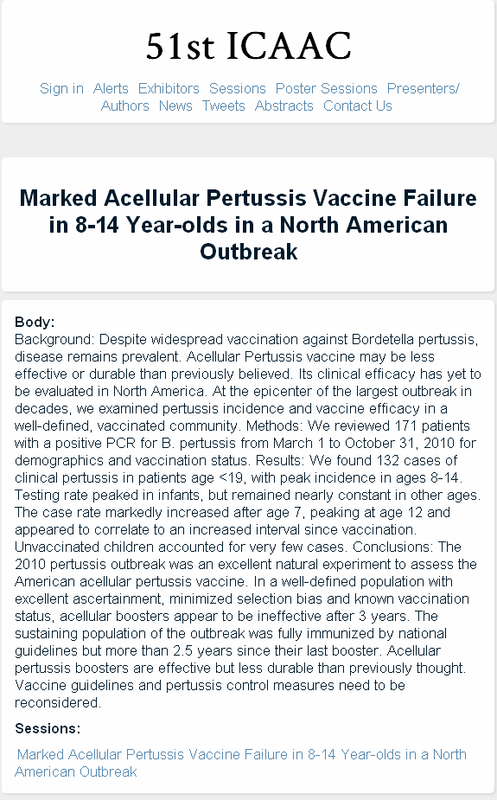 Pertussis has been in the news a fair bit recently. Actually, it's the vaccine against pertussis that has garnered a lot of attention after a recent presentation and study from the 51st Interscience Conference on Antimicrobial Agents and Chemotherapy. 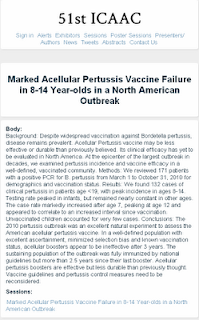 The presentation, Marked Acellular Pertussis Vaccine Failure in 8-14 Year-olds in a North American Outbreak, suggests that immunity from the pertussis vaccine can wane in as little as 3 years, covered a study by Kaiser Permanente Medical Center under the supervision of Dr. David Witt. The story has been picked up by a lot of media outlets, such as the Associated Press and subsequently regurgitated in places like ABC News, The Boston Globe and The San Francisco Chronicle. While the story raises some valid questions, there are some problems with how it is being presented. Blogging is not writing. It's just graffiti with punctuation. I went to see the new movie Contagion the other day. Over all, it was a decent flick. It was much more refreshing than other disease-based disaster movies, like Outbreak or The Andromeda Strain, in that the crew worked hard to get the science right. Also nice was that when characters died from the virus, there was no drawn-out "I'm dying; oh, the pain" dialogues with other characters. 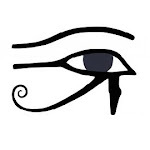 Like a real virus, death was heralded by serious awareness-hampering things like seizures. There were some quibbles I had with the film, but I'm not going to go into a lengthy review. Others have already done that far better than I could. Besides, I don't want to give any spoilers for those who have yet to see it. Instead, I want to focus on that quote up at the top of this post. People in positions of authority or renown ought to be careful with what they say and do. They are held to a higher standard because their actions can often have a rather influential effect on the public at large. A simple comment may be enough to sway how we think, what choices we make and may even have a huge impact on the economy. Suggesting that there may be something wrong with one product may steer people away from that product, at least for a time. It may even scare consumers away from the entire class to which the product belongs. It is very important, therefore, to do one's due diligence before saying something from a platform that reaches audiences in the hundreds of thousands. It's easy to make an error when speaking extemporaneously; we're all human, after all. But when a person's words and presentation are planned well in advance, when there is forethought, and when the topic has the potential to sway a lot of people, that person must tread carefully, dot all their "i"s and cross all their "t"s. It is disturbing when people in such public positions fail in this. On Twitter, I like to try to keep my followers informed of outbreaks of diseases like measles and pertussis. Some may need to get up to date on boosters for themselves or their children. Some may not be able to receive a vaccine due to a medical condition and so need to take precautions if they are in an area affected by an outbreak. To help me in this, I have some alerts set up to forward news articles to me. For the most part, they are sane, reality-based articles discussing the diseases or the vaccines without spin. Occasionally, something like this article comes along. Titled "Effectiveness of vaccines needs to be re-examined," it is an opinion piece, so I shouldn't really expect it to be as rigorous as an actual news story should be. However, I would, at the very least, like to see some measure of scholarship, especially considering the author, Ammitai Worob, has at least a college level education (degree in psychology from Hunter College, according to his bio). Why do I say this? Because he trots out a good number of anti-vaccine talking points that have been trounced numerous times over the years. The first question, and one that has become taboo to even ask, is whether childhood vaccines are actually effective. Every day, thousands of people in the United States take part in clinical trials. These studies look at all manner of things, from the effects of subtle variations in how a broken bone is plastered to psychological studies to studies evaluating new drugs or medical devices. Some studies simply look at healthy volunteers, trying to figure out the normal workings of the human body. Others want volunteers with specific conditions, hoping to understand the progression of a disease or working toward better treatments and outcomes for patients. Still others seek some blend of both healthy and patient subjects. They are conducted by curious, compassionate physicians with grants from the National Institutes of Health, by patient advocacy groups funded by donations and by both small and large pharmaceutical and biotech companies. There is a drive to learn more, to improve the health and well-being of people around the world. Sometimes the hoped for outcomes have very significant meaning, such as working toward a cure for a rare or severe disease. Sometimes they merely contribute to our own vanity, as with a new variation on Viagra or some manner of anti-aging drug. Suffice to say, there is a lot of research going on out there. And just one small area, one that I find very interesting, is research into vaccines: expanding our knowledge of how they work, how to make current vaccines even safer or more effective than they already are and developing new vaccines. It was with great interest that I discovered I had a new follower on Twitter going by the moniker @EVaccines, or ExperimentalVaccines. This person bills their web site and Twitter account as providing "information on Current and Ongoing Clinical Trails (sic) on Vaccine Research and there (sic) side effects." Cool! I thought. Here is someone who is providing information on current and ongoing trials on vaccines. This could be some very good, very useful, information! Would this be sort of an easier to navigate version of ClinicalTrials.gov tailored to vaccines? Perhaps there would be links to the various labs conducting vaccine research for those who are interested either in the study outcomes or specific projects under way, or for those who may actually be interested in volunteering to advance vaccine knowledge. So, I clicked on the link for their web site. The Montgomery County Health Department issued a press release September 2, 2011 alerting the public to two confirmed cases of measles. The index cases were two unvaccinated children who arrived in the U.S. on August 24. On Monday, August 29, they visited the Suburban Washington Resettlement Center, the Washington, D.C., branch office of the International Rescue Committee (IRC), located at 8700 Georgia Avenue, Silver Spring, MD. The IRC is an organization that helps refugees who have been invited by the U.S. to seek asylum here, helping them to get settled and rebuild their lives.